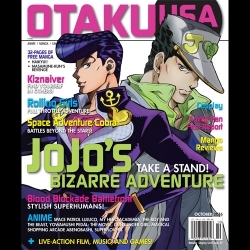 JoJo’s Bizarre Adventure continues to bedazzle and astonish modern audiences. The Rolling Girls is a visually engrossing road trip serial with a good deal of heart. There’s a lot going on in the zany streets of Blood Blockade Battlefront’s haunted New York City. Kiznaiver goes out of its way to invoke and twist the seven deadly sins. Space Adventure Cobra offers a dazzlingly strange final frontier. Acceptance is definitely on the rise!